Using Android to Make Money? 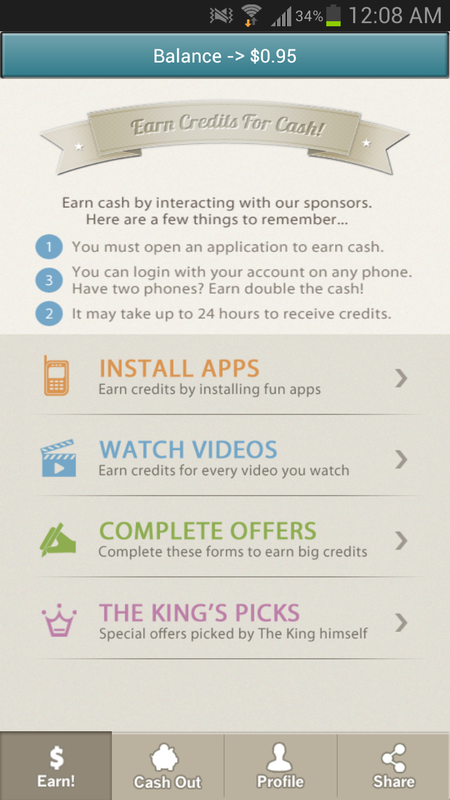 Cash King is an app that will pay you cash for the money you have earned. You can earn money by installing apps, watching videos, or completing offers. Most of the apps that you can choose to install will have a payout between 1 - 10 cents but there are many apps to download so it adds up. There are also some apps that payout 20 cents but there are only a few of these ones. Only requirement with apps is that you have to install and open them! Watching videos also gains credits - as advertised - but when I was testing out the app, this feature did not work. Finally, you can earn larger payouts ranging from 50 cents to a toonie by completing offers. Most offers require some form of payment (credit card, etc.) but there are a few that are free. One downside that you will recognize once you start using this app is that it takes up to 24 hours for your credits to show up. I guess that is the price for free money. The payout is delivered through PayPal or an Amazon Gift Card. You can cash out after you have earned $5. I have used the app for a day now and I have earned $0.95. This app is great if you have some free time. Get it at the Play Store and use referral code DDR5243 for $0.25 to start! 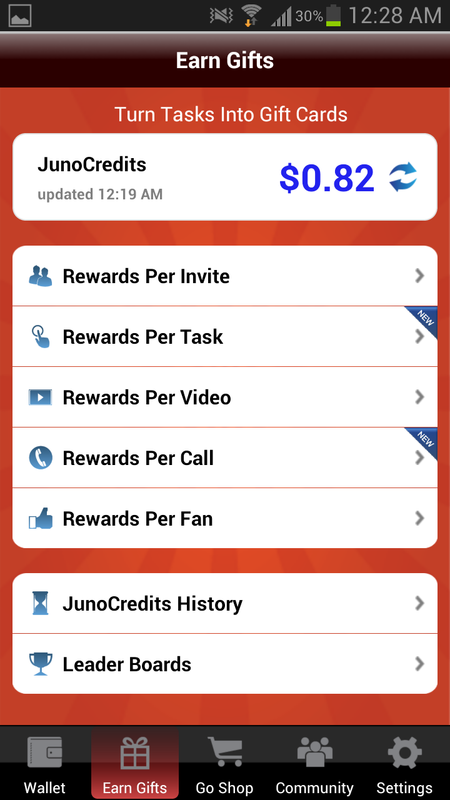 JunoWallet is very similar to Cash King. 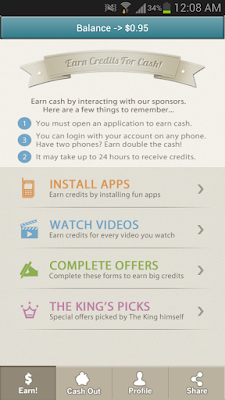 Like Cash King, you can earn through performing Tasks - which are basically offers, app installs, and video watching. 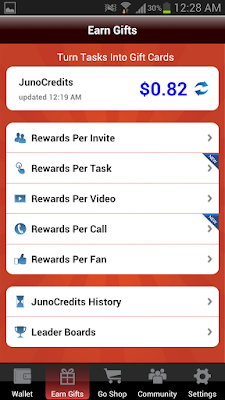 There are also other ways to earn unique to Juno Wallet, for example, rewards for calling (did not work when I was reviewing) and rewards for Facebook likes. Tasks that do not require any money generally earn 1 - 10 cents. Videos, which you have to watch for at least 20 seconds, are 1 cent each. On a side note, the videos are actually pretty interesting since all of the ones I had were Intel videos featuring various Ultrabooks. Calls did not work, and as a result I do not know how much they payout. Facebook likes are actually quite significant in value. They advertise that they are worth "up to 50 cents" per like but mine were worth 25 cents each. However, there were only two available at the time. The payout is delivered solely through gift cards. The gift cards include Facebook credits, Amazon Gift Cards, iTunes cards, Microsoft Points, EA Game Card, etc. You can even redeem a digital copy of Diablo III. The cards can be redeemed when you accumulated enough for the minmum payout for the card. For example, you need at least $5 for Starbucks, at least $20 for 1600 Microsoft Points, and $60 for Diablo III. I have used this app for a few hours and my balance is $0.82. This app instantly displays your balance unlike Cash King. Get it at the Play Store and use referral code TM1569064 for $0.25 to start!